Thanks to the complexity of the fiber optic installation and audio video system, the need for sending multiple signal types and control over long distances has increasingly become intense. Ethernet cables like Cat 5e, Cat 6 and Cat 7, is an indispensable component for home or small business. 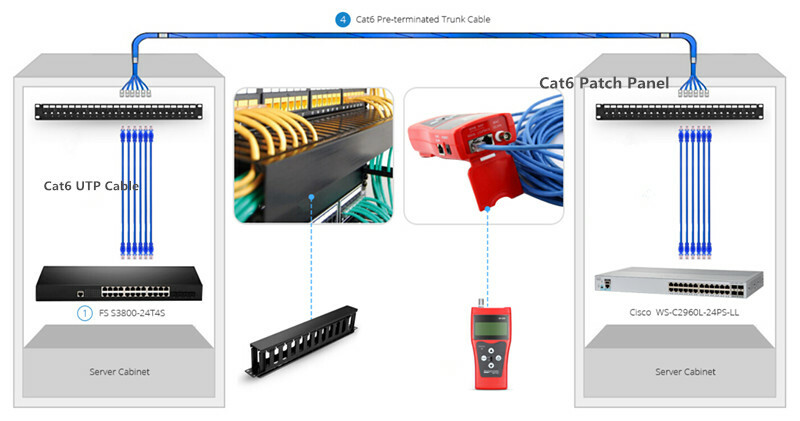 Nowadays most manufacturers will recommend the use of solid shielded Cat 6 cable with shielded connectors other than using the HDBASE-T chipset for signal extension. This type of cable can be terminated in the field or purchased in specific lengths already terminated. The following article provides a brief introduction to the reasons why we should use Pre-terminated Cat 6 cables for the signal extension. Figure 1 shows the UTP Cat6 cables, Pre-terminated trunk cables, FS optical switches, cable manager wire duct. Cat5 and Cat6 copper Ethernet cables are the commonly used types for 1G/10G networks. So, what is the benefit of using Cat 6 cable instead of Cat 5? In short, Cat 5e is a basic wire for home network. It is typically 24 gauge and can run 10 Gigabit network for 328 ft. While Cat 6 was developed to have 10 Gigabit networks. The only problem is that these wires were limited to a range of 164 feet. Above this, their speed will drop to 1Gbqs. Besides distance and speed, Cat 6 patch cable also has another important difference, it has tighter twists in the cables. This allows each pair of wires to have two-way communication with each other. Cat 5e has an occasional delay and a higher skew than Cat 6 does. This means that even though Cat 5 can run at a speed of a Gigabit, it will appear to be slower. With connectors terminated on each end, Pre-terminated copper bundles provide a time saving and customized solution for reliable and easy to install connectivity. The Pre-terminated cables are made to your exact specifications, so there will be no unused cables left to be stored. No cable waste, faster turnaround and no terminating on site which means less money spent on storage, labor and equipment. Figure 2 shows 6 Jack to 6 Jack Pre-terminated Copper Trunk Cable. The Pre-terminated Cat 6 copper bundles can be supplied in any length up to 60m and both ends have an installed Cat 6A modular jack (UTP). The cable bundle is held together with Velcro wraps at meter intervals and is generally supplied with 6 cables & installed jacks in a bundle. Each end of the Pre-terminated can be easily installed into an unloaded 19 rack mount patch panel, floor distributor or wall outlet. Cat 6 Pre-terminated copper bundles require less work on site as no technical skills are needed when installing and connecting the cabling infrastructure. Therefore, this solution eliminates the need for technicians to be on site terminating cable, since the Pre-terminated cables can be easily installed by routing and then loading the Pre-terminated directly into a patch panel. The installer in a lot of cases has to pay for his waste to be removed from site on many projects, especially if they include cable drums, more importantly the installer is purchasing a more accurate quantity of cable, they are buying by the meter and not by the drum, how many installers have their facilities cluttered up with odd lengths of cables in boxes hoping for a project that will use them up. Just as anything else, careful planning and product selection will be the key to a successful installation. You must consider resolution, distance, signal type or types, and physical layout when choosing a signal extension product. FS.COM Pre-terminated Cat 6 copper bundles offer rapid deployment coupled with guaranteed performance. Please feel free to contact us if you are interested.